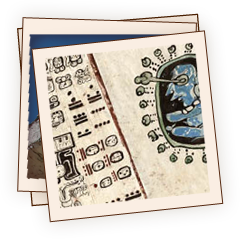 The Sun and traditions concerning time are very important throughout the land of the Maya. Systematic observations of the passage of the Sun directly overhead twice a year, allowed the Maya to make very accurate calculations defining the length of a solar year. The Maya were accomplished mathematicians. They invented the concept of zero, and recorded mathematical tables to predict solar and lunar eclipses. Maya astronomers had the ability to predict and mark the passage of the seasons by observing the movements of the Sun along the horizon, or the Sun’s movements with respect to the pyramids and other temples. The Sun and its cycles are the foundation for Maya calendar keeping. The Maya observed and recorded the yearly cycles of the Sun; including the times of equinoxes, solstices, and the zenith and nadir passages. Astronomical patterns and planting and harvesting cycles of corn influenced Maya culture and their sense of time. Maya math is fun, and playing the interactive game can teach us about the Maya system and the more common, decimal way of doing mathematics.